From sealcoating to line striping, to asphalt repair and more, Go iPave is a powerful tool to help you deliver jobs that thrill your customers and optimize your profits. 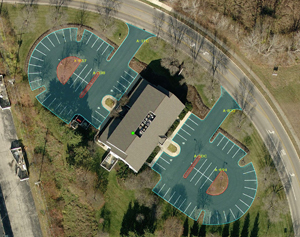 Go iPave is more than a parking lot measuring tool. It can help you streamline operations, accelerate your marketing efforts and communicate better with clients and prospects. 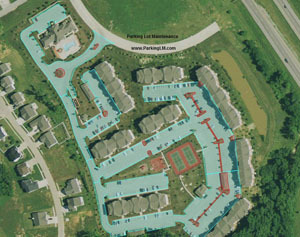 Anyone on your staff (from administrator to head estimator) can measure any property in the U.S. or Canada. You can dramatically reduce drive time (labor), wear-and-tear on vehicles and fuel costs associated with property measurement. Your site visits become quality inspections that impress your prospects and build your competitive sales advantage. Start profiting from Go iPave today. Get your FREE Trial now. 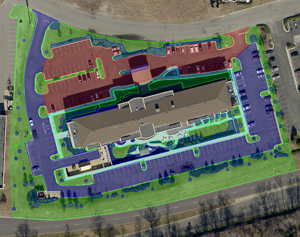 Measure any outdoor surface on any property type. A picture says a thousand words- and a picture can help you make, or perhaps save, thousands of dollars. 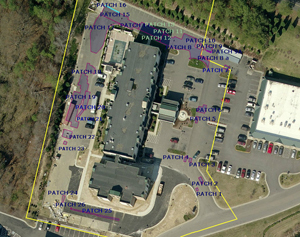 Go iPave’s property photos can seriously open up the lines of communication with your customers and crews to ensure everyone is on the same page about your scope of work. 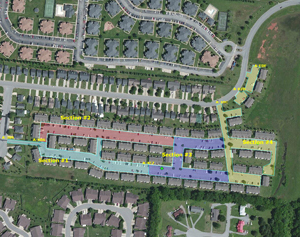 Our labeling tools and option to color code property features and measurements will help you explain how, when, where and who will be responsible for servicing the property, leaving no unanswered questions. 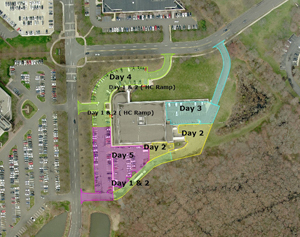 Color-code areas for different services, scheduling needs, equipment needs etc. Start communicating with Go iPave photos today. Start your 14-Day trial. Have you ever overestimated or, even worse, underestimated the amount of materials needed for a job? Know exactly how much product, crew members, equipment etc. you need to get the job done right the first time. Streamline your estimates – Start your trial today. 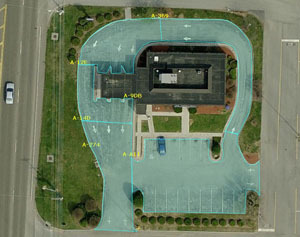 Parking lots of any shape and size can be measured on Go iPave. Environmental Management, Columbus, OH. Measuring properties on Go iPave not only allows you to turn your estimate around faster, it helps you measure more properties so you can bid more jobs and win more sales. Instead of wasting time driving across town from one property to the next, you’ll impress your prospects with quick, professional responses. See how Go iPave can help you produce better bids today. Do you use Microsoft Excel to help you prepare estimates? With a click of a button, your Go iPave measurements export to an Excel spreadsheet. 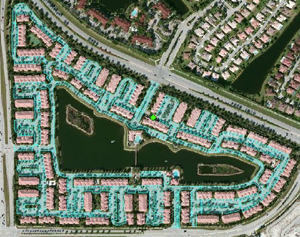 Save a comprehensive record of all Go iPave property measurements and objects counted (such as parking stalls) to your computer. Go iPave property photos are also easy to save, print and email. You can save as many Go iPave photos to your computer as you need to in order to help you get your job done. Keep your crews focused and productive on the job. 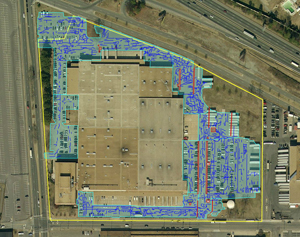 Use Go iPave site maps to visually assign work and ensure work is done right the first time. Print three copies… one for your property manager, crew foreman and office staff. Now everyone is on the same page (literally) about what you and your customer have mutually agreed upon. 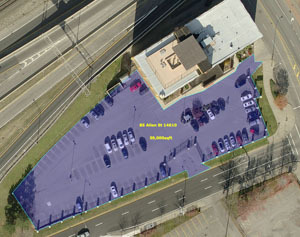 Your Go iPave site maps are also powerful customer service and sales tools. Use them to show your customers exactly when you will service a property, who will be on site, and how you will execute the service. It will impress them, trust us. Start impressing prospects with property photos. Get started today with a Free, 14-Day trial. Go iPave pays for itself from the first time you use it. When you reduce the time and expense of property measurement, the savings flow to your bottom line. Your time savings will as well. You’ll have more time to spend with your customer, which will score you rave reviews and profitable referrals. Start winning more sales today. Get started with your Trial today.